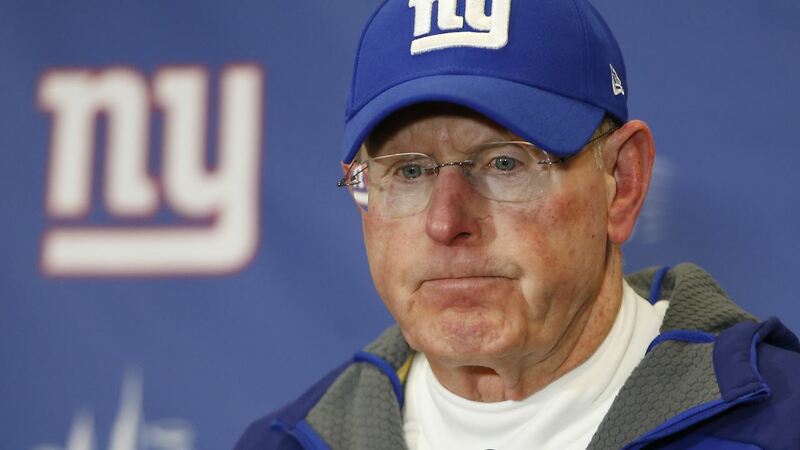 EAST RUTHERFORD, New Jersey -- Tom Coughlin has said goodbye to the New York Giants. In an emotional farewell on Tuesday, the 69-year-old Coughlin thanked his players and the organization for a 12-year tenure that included two NFL titles. He even said he might not be done coaching. Speaking a day after stepping down following four straight years out of the playoffs, Coughlin called the Giants job a dream come true for a youngster from a small town in upstate New York. He nearly broke into tears thanking his wife, Judy, for being his quarterback through the ride. Coughlin sounded as if he were addressing a congregation during his 18 minutes on stage, stressing the values of winning the right way, building character and preparing players for life after football. Winning two Super Bowls was his legacy with one of the NFL's founding franchises, but he said what he will remember most will be the relationships developed over the past 12 years. It showed in the audience in front of him. Eli Manning and fellow current Giants Victor Cruz, Rashad Jennings, Zak DeOssie and Mark Herzlich sat in front of him, along with former players Shaun O'Hara, Rich Seubert and Chris Snee, his son-in-law. "Winning, losing, playing hard, playing well, doing it for each other, winning the right way; winning the right way is a very, very important thing to me and all of our coaches," Coughlin said. "That's what motivates and inspires us. Championships are won by teams who love one another, who love and respect one another, who play for and support one another." "He's a Hall of Fame coach, a Hall of Fame person. He leaves big shoes to fill," Mara said. While there is no timetable to find a new coach, Mara wants to find the right man sooner than later with five other teams (Browns, 49ers, Dolphins, Eagles and Titans) looking for new men to lead their teams. Mara and Reese will do the initial interviews. Current offensive coordinator Ben McAdoo and defensive leader Steve Spagnuolo will be interviewed. Mara made it clear that he and co-owner Steve Tisch decided to make a coaching change before meeting with Coughlin on Monday. The coach didn't make them have to fire him. He broached the topic first and walked away gracefully. "Listen, we had 12 great years," Mara said. "All good things have to come to an end at some point in time. But I can never begin to repay him for everything he's done for this franchise." Mara said general manager Jerry Reese needs to improve the roster, but feels he remains the right man for the job. The Giants finished at 6-10, and Reese said the team is not too far away from contending for another title despite posting losing records the past three seasons. "Jerry knows this is on him. I've had that discussion," Mara said. "You can't hide from the record. It's up to you now to get it fixed because the last three years are just not acceptable." The Giants lost six games this season either in the final 1:14 or in overtime. It was probably the difference between Coughlin staying and going. "Obviously when you're 6-10 a couple years, everybody tells you you're a bad team," Reese said. "In the National Football League things can get fixed quickly. We expect to do that. We expect ... to have a chance to get back in the tournament and play Giants football like we like." On Monday, players said they failed their coach. Coughlin was moved by the comments, and he took time to address Manning, who joined the Giants the same year as him. "He thinks he's the reason. He's not the reason," Coughlin said. "Eli, it's not you ... it's us. We win, we lose together. When we lose, I lose. When we win, you guys win. That's the way it is. That's the game." Coughlin said addressing the news conference was harder than talking to the media before Super Bowls. But he had a final message for the organization and its fans. "We don't say goodbye, we just say, next time," he said.